Did you know that on average it takes about nine months to build a Publix store? Even before the first load of concrete is poured, there are months – sometimes years – of planning. When all the planning and hard work is complete, it’s cause for celebration! But there’s one more thing that happens before the customers arrive on opening day. The night before the store opens, we hold a special Family Night for the associates and their families. This pre-opening celebration is a long-standing custom started by Publix founder George Jenkins. 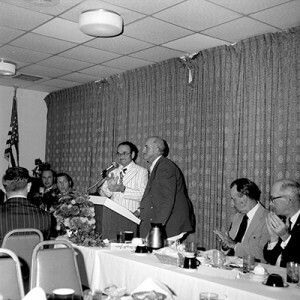 In the early days, a dinner was held at a restaurant or local banquet hall. Mr. George and other top executives made speeches and shared inspiring words of appreciation and encouragement. This custom has continued for decades, but today we hold the Family Night event at the store, and associates invite their families for a sneak peek at the new store before it opens. There are refreshments and sometimes entertainment, and top executives are on hand to congratulate the team. Each member of the store’s management team, along with their family, receives time in the spotlight when they are officially introduced to the crowd. To close the ceremony, the store manager accepts a commemorative key to the store. After the pre-opening fun and fellowship, it’s time to head home for a good night’s sleep to be ready for the big day. Another custom still in place today is the grand opening celebration. Special guests and local dignitaries are invited to attend, and the store manager is introduced to the crowd. Before the doors open, it’s time to cut the ribbon. 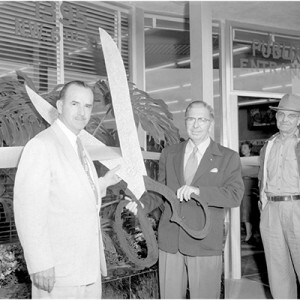 In the 1950s, a giant pair of scissors was often used for the ceremony. Over the years ribbon-cutters have included city mayors, celebrities and even beauty queens. In 1964, two Southern Belles from the famous Cypress Gardens participated in the grand opening ceremony for Publix’s Winter Haven, Florida, store. Then and now, each individual store opening is a little different. Some involve the local school band or other entertainment. But every store opening has one thing in common: a crowd of customers ready to shop in their new store! It’s exciting to see the crowd waiting to walk through the doors for the first time. That’s the way it was many years ago, and it’s still just as exciting today. Check out what store openings are like today by visiting our Facebook albums. If you’ve ever attended a Publix Grand Opening, we’d love to hear your story!